Synonyms: Euphoria longana, Nephelium longana. 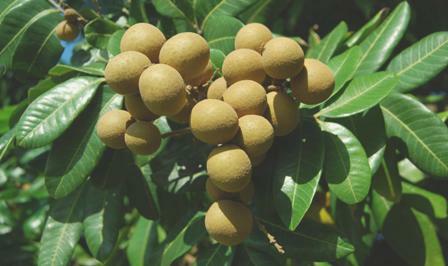 Longan is a minor but popular fruit of the tropics. It is believed to be a native of South China. It is cultivated from Southern China to several South East Asian countries, Srilanka and South India. The fruit has now been introduced to many other warmer parts of the world including Australia, Brazil and United States. Tree, up to 40 m tall and 1m trunk diameter, sometimes buttressed, exceptionally a scandent shrub. Leaves 2-4(-6)-jugate, axial parts mostly densely hairy; petiole 1-20 cm, petioles 0.5-35 mm long ; leaf elliptical, 3-45 cm x 1.5-20 cm, 1-5 times longer than wide, chartaceous to coriaceous, above often tomentose in basal part of midrib, beneath thinly tufted-tomentose mainly on midrib and nerves. Inflorescences usually terminal, 8-40 cm long, densely tufted-tomentose; cymules (1-) 3-5-flowered; pedicels 1-4 mm; bracts patent, 1.5-5mm long; flowers yellow-brown; calyx lobes 2-5 mm x 1-3 mm; petals 5, 1.5-6mm x 0.6-2 mm, densely woolly to glabrous; stamens (6-)8(-10), filament 1-6 mm. Fruit drupaceous, 1-3 cm in diameter, lobe(s) board-ellipsoid to globular, smooth to warty or sometimes up t 1 cm aculeate, sometimes granular, glabrescent, yellow-brown. Seed globular with shining blackish- brown testa; seed enveloped by a thin fleshy, translucent white arilloid which forms the edible portion of the fruit. The fruits are mostly eaten fresh. The fruits, especially the ones with a smaller sized seeds, are canned in their own juice in Thailand, China and Taiwan. 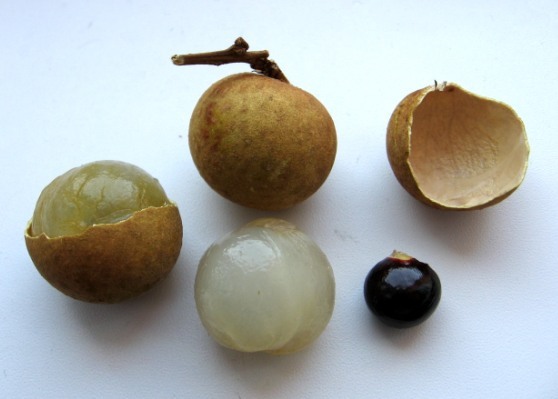 Longan can also be preserved dry, either intact or after removal of the pericarp. The dried flesh is black, leathery and smoky in flavour and is used mainly to prepare a refreshing drink. 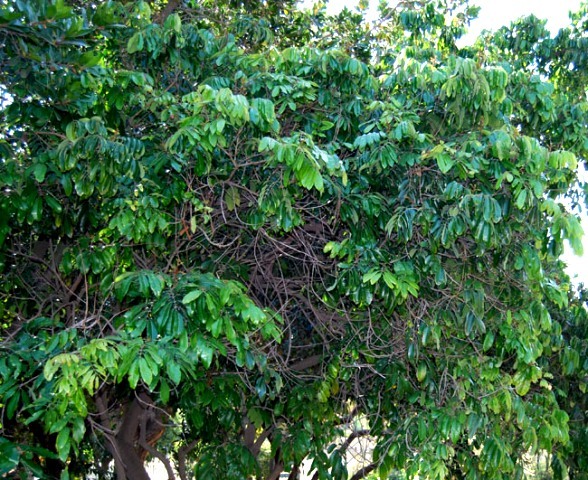 Besides fruits, the Longan trees also yield a hard and useful timber. The edible portion content of longan fruits ranges from 67 to 78% of the whole fruit. Composition of longan per 100g edible portion is : water 72.4g, protein 1.0g, fat 0.5g, carbohydrates 25.2g, fibre 0.4g, ash 0.5g, Ca 2 mg, P 6 mg, Fe 0.3 mg, vitamin C 8 mg. The energy value averages 458kj/100g. The sugar content of longan fruit is quite high. 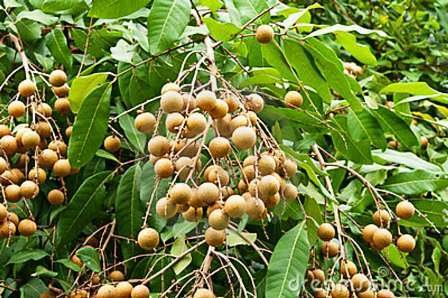 Longan is basically a subtropical plant also grows well in the tropics. The tree requires ample soil moisture during the period between fruit set and maturity. Optimum annual rain should be from is 1500-2000 mm. Though seeds also germinate but take 7-8 years to come into bearing. The most common method of propagation is air layering. The air layered trees usually come into bearing after three years but the yield keep increasing till 9-10 years when the trees attain full bearing. In China, approach grafting is also practiced for propagating longan trees. Longan trees thrive best on rich sandy loams. It can also do well on oolitic limestone. In northern Thailand longan orchards are often situated on the lighter soils along former river courses. As the trees are large, so the planting distance is 8 to 12 metres. Longan fruits are non-climacteric type and have therefore to be harvested when properly ripe. These will not ripen during storage. Maturity is determined by fruit shape, skin colour and taste. Immature fruits are tasteless. The mature longan fruit has a dark, smooth skin, the inside of which is netted and tastes sweet.